Price-wise, the Audi A1 slots between the similar-size VW Polo, with which it shares a lot of its major parts, and the larger VW Golf. It was a successful formula for the previous model and one that Audi hopes to repeat with this latest, all-new one. The one thing it won't be repeating is the old car’s three-door body style. The new A1 is only available as a five-door; what Audi calls a Sportback. It certainly makes getting into the back of the car far easier, while simplifying the buying process. Its most obvious rivals are the Mini five-door and, at a pinch, and the DS 3. The Mini is the most fun to drive and to spend time in. A VW Polo is a good alternative since you get many of the A1’s parts for around £1,500 less. However, good-looking though it is, the Polo can't match the A1’s image and it’s for its upmarket image that people buy the little Audi. The DS 3 feels ancient in comparison to this new A1. The styling is sharper than the old car, and inspired, says Audi, by motorsport and fast Audis of old in its blistered wheelarches, short overhangs at the front and rear, thick rear screen pillars and bonnet slots. It’s a bigger car than the old model, and the interior now feels more spacious and is certainly more attractive and up-to-date. The dashboard is dominated by an 8.8-inch (10.1-inch with the optional Technology Pack) entertainment screen. As is increasingly the fashion with small cars, owners can personalise the A1’s interior with different colours and upholsteries, although some of the interior plastics are not up to the usual Audi quality. The A1's standard equipmeny level is high - LED front and rear lights with sweeping indicators are standard on the basic SE, as are 15in alloy wheels and lots of safety kit are included. Be wary of specifying sports suspension - it can make the ride uncomfortably firm. The remaining trims, Sport and S line, are familiar from other Audi models. Sport brings larger wheels and sports seats, and S line, sportier bodywork and that firmer suspension mentioned earlier. All the engines are petrol but are quite difficult to compare with rival cars. This is because instead of identifying them by engine size, Audi identifies them by a two-digit number that corresponds loosely to the power they produce. For example, the launch engine, a 1.0-litre petrol producing 116hp, is called the 30 TFSI (TFSI is Audi’s petrol engine technology), while the lowest powered engine, also a 1.0-litre but producing 95hp, is the 25 TFSI. The 30 TFSI is quite quick on paper (0-62mph takes 9.5 seconds) but feels slower thanks to long gearing that is designed to help it achieve better economy. Once up to speed, it’s relaxed on the motorway. So far, the more powerful 35 TFSI, a 1.5-litre turbo producing 150hp, promises to be the most rounded and satisfying engine. The most powerful one, the 40 TFSI, feels quite lethargic, at least when fitted with the rather slow-witted, automatic gearbox. The steering feels pleasantly weighty and direct and the car doesn't lean too much in corners, so it’s fun to hustle along country roads. It’s quiet on 17in wheels, and very comfortable too. 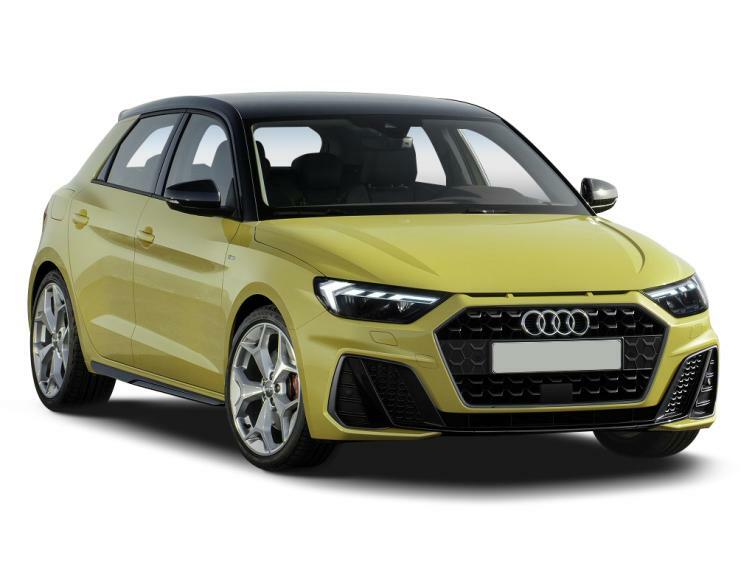 The new Audi A1 is a sharper looking, better equipped and more compelling car than before and, as before, still facing only one direct rival in the Mini five-door. That car is more fun to drive but the A1 looks sportier and has a much bigger boot. Both cars hold their value well and are surprisingly affordable on a PCP basis. Deals on the Mini are far more generous, though, a fact that could swing it for many buyers. As this was written, we had no economy figures for this model but we’d expect it to be just slightly more economical than the more powerful 30 TFSI, which returns 57.6 - 58.9mpg. Although we don't have performance figures for the new 35 TFSI engine we do know it produces 150bhp, easily enough to haul a family of four or, at a pinch, five. It’s a smooth engine and punchy. As the basic trim, SE has the most comfortable suspension, while standard equipment includes lots of safety kit. This most powerful A1 produces 197bhp and has sporty bodywork and firm suspension. It’s not the most comfortable or polished version but it is sure to be the quickest, at least until an S1 version arrives. The slowest engine with the sportiest and most expensive trim is not a good combination. Your money is better spent upgrading at least to the 30 TFSI. 2018 Audi A1 launched in five-door Sportback form only (the previous models was in three as well as five-door forms) costing from £18,450. Only the 30 TFSI engine at launch. Trims are SE, Sport, S line and S line Competition (40 TFSI only). Also, two launch special editions S line Contrast Edition and S line Style Edition. These identify how much standard equipment an A1 has. There are three trim levels with a fourth reserved for the 40 TFSI model. The two-digit number relates to the engine’s power output and the letters TFSI that follow are shorthand for Audi’s petrol engines. S tronic is Audi’s name for its seven-speed automatic gearbox. The Audi A1 is powered exclusively by petrol engines – there is no diesel and, as yet, no hybrid. They are all turbocharged for extra power and have a particulate filter to clean up their emissions. Audi is unusual in identifying its engines with a two-digit number rather than by their capacity, as other car makers do. The number relates to the engine’s power output, although not directly. Power outputs are arranged by bands and the two-digit power identifier rises or falls in increments of five according to the band it falls in. Audi says it has adopted the system because power outputs no longer reflect engine sizes. For example, 30 applies to power outputs in a band spanning 108 to 128hp. The 30 TFSI in the A1 produces 116hp (it’s a 1.0-litre engine, by the way). The next band down is 25 TFSI, which has a 95hp engine. The 30 TFSI is economical but this has been achieved by lengthening the gear ratios to the extent that it can do 70mph in second gear. This makes it feel quite slow and it requires swift gearchanges to achieve the official 0-62mph time. Generally speaking the S tronic automatic versions of the A1 are slightly quicker and more economical than the manual ones. Standard equipment across the new range includes an 8.8-inch display and multifunction steering wheel. The optional Technology Pack adds a sat nav within a 10.1-inch dynamic instrument binnacle called Audi Virtual Cockpit that can change its function and appearance as required. Optional Audi Connect also offers route guidance. All versions have a digital radio while a B&O uprated system is an option. Standard safety equipment includes a speed limiter, lane departure warning, pre-sense front (a radar-based system that spots forward hazards and if necessary brakes the car). Options include assisted parking. The three core trims – SE, Sport and S line – are familiar from other Audi models. S line Competition is reserved for the 200hp 40 TFSI sports version. SE trim has LED headlights with eye-catching sweeping indicators and 15in alloys. Sport adds larger wheels and sports seats, while S line brings sportier bodywork and firmer suspension. S line Competition has the obligatory red brake calipers. For a short while only, there are also two S line-based launch specials called the S line Style and S line Contrast, each featuring unique styling and 18in alloys. The Audi A1 has a three-year new car warranty, capped at 60,000 miles. It’s hardly ground-breaking and is the same as sister brand Volkswagen’s, but not as generous as BMW’s three-year, unlimited mileage warranty. Whether it means an Audi is any less reliable than a BMW is a moot point. The new A1 is based on the VW Polo launched in 2017. That model didn't figure in the 2018 Auto Express Driver Power owner satisfaction survey but reports suggest it’s perfectly reliable. There’s little reason to suppose the new A1 won't follow suit. Used examples of the new Audi A1 won't begin appearing until later in 2019 when the first dealer demonstrators are offered for sale or cars are pre-registered to achieve monthly or quarterly sales targets. Discounts on new A1s are virtually zero at present so don't expect these first used cars to offer substantial savings. Depreciation, a key factor in calculating PCP costs, is likely to remain comparatively low during the model’s life, making new and used A1s surprisingly affordable on finance. The new A1 is longer than the car it replaces. The styling is sharper, too, and inspired by motorsport with its blistered wheelarches, short overhangs, and bonnet slots. Petrol engines are only on offer at the moment. Hybrid systems are set for the future. Standard equipment includes LED front and rear lights with sweeping indicators, 15in alloy wheels, and lots of safety kit. Be wary of specifying sports suspension, which can make the ride uncomfortably firm. The dashboard is dominated by an 8.8-inch (10.1-inch with the optional Technology Pack) entertainment screen. Owners can personalise the A1’s interior with different colours and upholsteries too. There is more room in the back than the old car - but it would become a chore for three adults to sit in here for a long journey. At 335 litres, its up 65 litres from the old car. It is slightly down on the VW Polo (351 litres) though.